While I have been traveling on my retirement adventures in Asia my nights’ accommodations have varied from hard seats on overnight trains and buses, straw mats in shared rooms, to other places that I would call distinctly middle range. Many have been quite nice and I wouldn’t trade any of the experiences. One area that I hadn’t experienced here before was one of “Ultra Luxury” and when the Okura Prestige Hotel in Bangkok offered Sarah and I the opportunity to be their guests as part of the heaven in our “Heaven and Hell” weekend we jumped on the opportunity. 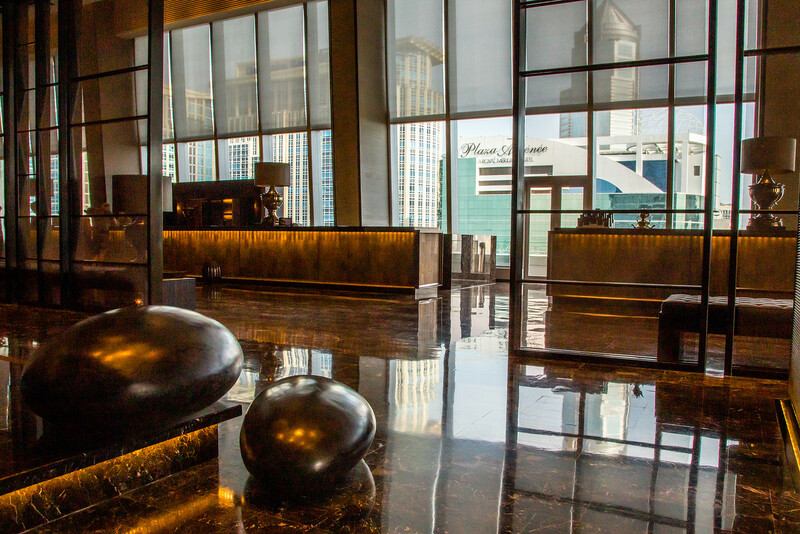 Located in the heart of the Central Business District at the corner of Phloen Chit and Wireless Road is within walking distance to Central World, Siam Paragon and the American Embassy. BTS SkyTrain Station Phloen Chit can be reached via covered walkway to give access to the rest of Bangkok. It is close to Lumpini Park, and many other Bangkok attractions. What is it Like to Sleep in a Capsule Hotel? 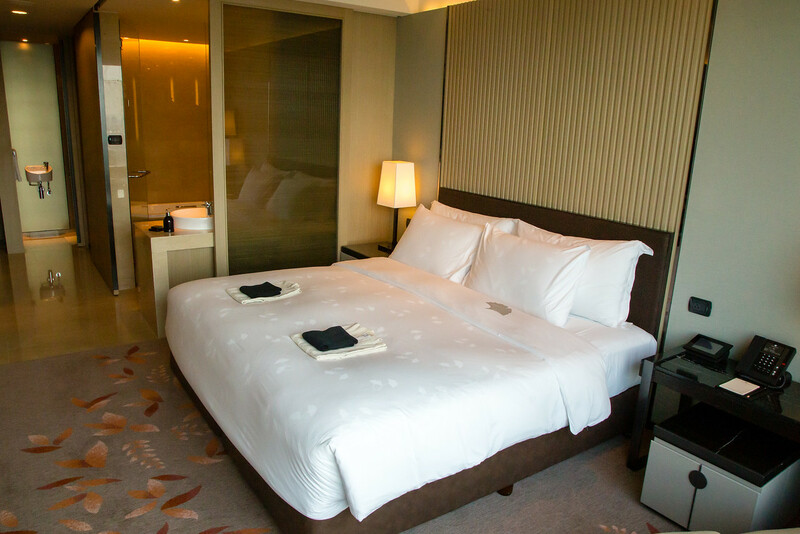 Based in Japan, the Okura Hotel chain specializes in what they call ‘Simplicity and Elegance’ and our room certainly was that. After being whisked from the lobby on the 24th floor to our room on the 30th we were greeted with in-room fruit and flowers, huge triple paned windows overlooking the Bangkok skyline, a bathroom with a high intensity waterfall rain shower and separate tub and, something I had not experienced before, a separate, electric Japanese style bidet and toilet. (It really is pretty amazing!) The bed linens were Egyptian cotton – the robes and towels were soft and luxurious – and all the other amenities spoke of understated elegance and comfort. The attention to detail was amazing! Unlike most of the places I stay, the light switches, wall sockets, and other amenities were intuitively located and well placed. This may seem minor but if you have traveled much in SE Asia, you know what a great surprise this can be. There was a LED 42-inch flat-screen TV, a touchscreen control panel by the bed, hidden USB plugs for charging electronics and, even though we never turned the TV on, apparently, there is a full selection on multilingual TV channels and free video on demand. The centerpiece of all this luxury is the 26th floor, 25-meter cantilevered infinity pool that also overlooks the Bangkok Skyline. In addition to the hotel being named one of the Top 10 in Bangkok, the pool has been named one of the Top 10 pools in the city. Even though the Okura is fantastically located, we didn’t leave the hotel from the day we checked in until the next morning. We got to try the “Food, Family and Friends” menu on the cantilevered deck of “Elements” restaurant and had an international breakfast buffet at the “Up and Above” restaurant, also located on the 26th floor. The entire staff was amazing efficient and friendly. You could sense that the people took pride in their jobs and liked working there. They were never intrusive but you could tell they were available to help if we needed anything. We felt very pampered. Again, I think that the ‘Simplicity and Elegance’ theme was at work here. Everything I could imagine needing was available but it didn’t feel overwhelming. The public spaces were large but still felt welcoming and were stylishly lit. Nothing was out of place. 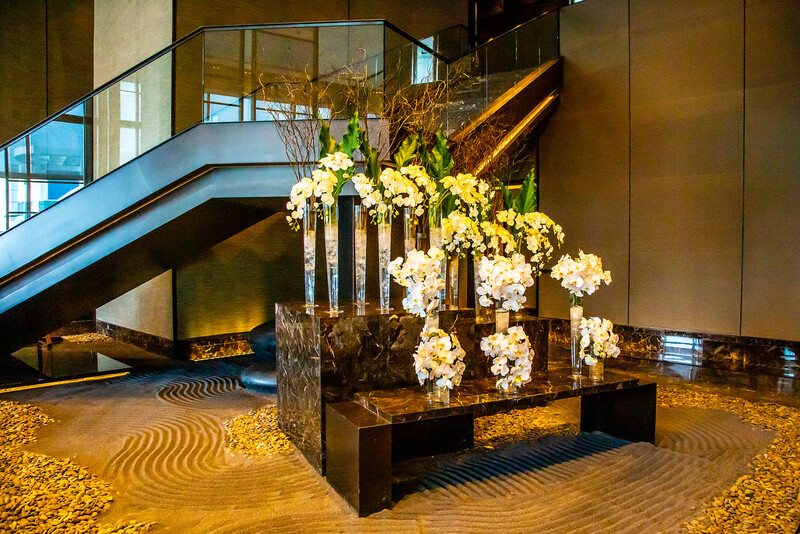 There was a beautiful rock garden in the lobby, fresh flowers everywhere and there was a pleasant Zen feeling to the entire experience.